Fr. Cedric Pisegna, CP, Live with Passion! Being present to a person in the final stages of their life is a sacred trust. As physical life draws to a close, a different kind of life begins. It may be a time of solitude or a period of great intimacy with family, friends, and of course, with God. Throughout the process of dying, there may be feelings of anger, denial, grief, resignation, or acceptance. Whatever the process, each person approaches death differently. When it is determined that medical treatment has been exhausted and a patient’s life expectancy is diminished, the focus shifts from curing disease to maintaining the quality of remaining life. A team of professionals—doctors, nurses, social workers, dieticians, and chaplains—all work together to provide the hospice patient with care that supports their physical, psychological, emotional and spiritual needs. Fr. Simon has worked as a volunteer with the Houston Hospice and Palliative Care System since 1991. Now in his 80’s, he says that sometimes he gets up and he doesn’t feel great. But then he gets the call to come and minister to someone in need, and he feels energized. Fr. Simon entered his ministry to hospice patients after his own recovery from colon cancer. He went through a year of chemotherapy after surgery and attended cancer support groups, an experience that helped him to empathize even more with the sick and dying. He recalls that some years later, a fellow group member confessed to him, “When you walked into the group for the first time, I thought ‘he won’t make it.’” “I guess I proved her wrong,” he says with a chuckle. In addition to ministering to hospice patients, Fr. Simon works in elder care and publishes a newsletter for seniors called “Think Life.” The title says a lot about who Fr. Simon is. 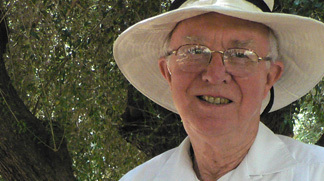 To talk with him is to hear a priest of vibrant spirit who embraces life and hope, even in the face of death, and who is very grateful for the opportunity to serve in a ministry that is very much about the Passionist way of reaching out to all with compassion. Error: Error validating access token: Session has expired on Monday, 18-Mar-19 14:16:37 PDT. The current time is Saturday, 20-Apr-19 19:43:19 PDT.